In addition, as of July 1, 2017, the Environmental Handling Charge will increase from $0.25 to $0.50 cents per each mercury-containing light sold at retail in or into Washington State. This increase will cover program costs from the significant decline in CFL (compact fluorescent lamp) sales between 2015 and 2016 – a 38.5% decrease; collections of covered lights have increased 18.5% in the same time period. With more than 220 collection sites in Washington, including businesses and municipal facilities, LightRecycle has recycled more than two million mercury-containing lights since launching in 2015. LightRecycle allows individuals and businesses to recycle up to 10 mercury-containing lights per day at sites throughout Washington – find a location near you. Submit an individual carpet stewardship plan to the Department by Oct. 19, 2017. The plan further outlines CalRecycle enforcement actions and priorities. CARE’s plan, CalRecycle’s FAQs, comments, the disapproval, and more are all available on CalRecycle's carpet stewardship plans website. Resource Recycling covered CalRecycle’s disapproval of CARE’s plan and the history of the "long-brewing conflict... [and] rare public breakdown", while CARE shared their perspective in April and June 2017 carpet stewardship program updates. May marked one year of take back operations for the Australian paint stewardship program Paintback, during which they recycled more than 1,000,000 kilograms of paint. Paintback established 47 collection sites in every state and territory, and located within 20km of 60% of the Australian population. Paintback is "funded through a 15 cents plus GST per litre levy on eligible products, between 1 litre and 20 litres inclusive," which goes to Paintback Ltd, an independent, not-for-profit organization. Its governing rules "ensure that these funds are used to establish and operate the collection program and research new ways to repurpose unwanted paint materials." The French ministry of environment approved a new producer responsibility organization for household packaging waste for 2018 (Léko), "bringing competition to the virtual monopoly Eco-Emballages has until now enjoyed." And home furniture stewardship organization Eco-Mobilier ('eco-furniture' in English) reports that it diverted 366,000 tonnes of furniture to recycling, reuse, and energy in 2016, up from 250,000 in 2015. Watch a brief YouTube video from Valdelia, the French stewardship organization for professional furniture, on how the program works. The Product Stewardship Institute (PSI) created a phone book opt-out toolkit for ease of shareability, with free content for social media and print materials (graphics, video, etc.). 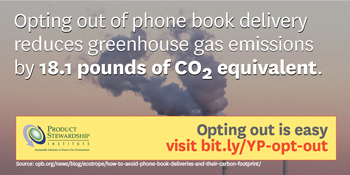 The phone book opt-out toolkit is a resource designed to help government officials, environmental advocates, teachers, and other interested community members to join in #GetOffMyDoorstep or launch their own phone book opt-out campaign, encouraging residents to take 3 minutes to opt out of getting a phone book. Local governments pay nearly $60 million annually to recycle or dispose of unwanted phone books, and each year the industry uses an estimated 4.68 million trees worth of wood fiber, equal to 14 football fields' worth of forest per day. King County hosted the 3rd LinkUp Mattress Recycling Summit on May 24 in Kent, WA. Participants discussed the mattress stewardship programs in Connecticut, California, and Rhode Island, the experiences and challenges with transfer stations and mattress recycling in Oregon and Washington, and the concept of product stewardship. In July, King County intends to release a Request for Proposals (RFP) for 2018 transfer station mattress recycling service at five of the County's eight transfer stations. King County views transfer station mattress recycling as an interim step towards a state-wide mattress stewardship system; a coalition of supportive mattress retailers, recyclers, haulers, nonprofits, and local governments would be necessary for a statewide product stewardship bill to succeed in the legislature. Summit participants expressed interest in mattress stewardship and coalition building. Join this series of webinars about six families or "classes" of chemicals which contain many of the harmful substances found in everyday products, brought to you by the Green Science Policy Institute. Each hour-long webcast will feature three short videos and live conversation with distinguished scientists and thought leaders. Learn more about the science of the Six Classes, where they are used, why they are harmful, and how to reduce their use in everyday products. A recent conference on Highly Fluorinated Compounds at Northeastern University addressed "issues raised by per- and polyfluoroalkyl substances (PFASs)" and "ubiquitous exposure in consumer products and discrete historic and recent contamination discoveries in drinking water and soil around the world." A 12-part series in The Intercept by Sharon Lerner documents the harms associated with DuPont's chemicals PFOA (or C8), PFOS, and GenX. Environmental Working Group (EWG) and Northeastern University "collaborated to produce an interactive map that combines federal drinking water data and information on all publicly documented cases of PFAS pollution from manufacturing plants, military air bases, civilian airports and fire training sites." Nonprofit and NWPSC member Zero Waste Washington (ZWW) is working on a project to identify and reduce phthalates from outdoor products in proximity to two Superfund sites in Puget Sound. ZWW will test outdoor products (such as street paint, building caulking, fencing material, traffic cones, etc.) for phthalate concentrations and conduct outreach to businesses and agencies about alternative products that contain low/no phthalates. The project will be overseen by an Advisory Committee of agencies who conduct source control activities in the Seattle Duwamish River and Tacoma Commencement Bay cleanup areas. The goals are to reduce phthalates input into stormwater and improve source control, reduce impacts to humans who use the products, and provide information that can be used locally and nationally as we move away from toxic chemicals in products which cause impacts both during use and at end of the life of those products. The award-winning documentary "STINK!" can be viewed for free online. "STINK!" follows the journey of Director Jon Whelan as he tries to uncover the truth about regulations in the chemical and cosmetics industry. Follow Jon through boardrooms, to back alleys, and the halls of Congress as he stumbles on a huge issue in America – which is that some products on our store shelves are not safe – by design. On April 29, 2017, the U.S. Drug Enforcement Administration (DEA) and more than 4,200 of its law enforcement and community partners collected more unused prescription drugs than at any of the 12 previous National Prescription Drug Take Back Day events: 900,386 pounds (450 tons) at close to 5,500 sites across the nation. Since September 2010, these DEA events have altogether collected 8,103,363 pounds (4,052 tons) of prescription drugs. DEA’s next National Prescription Take Back Day is October 28. The Yale University owned Journal of Industrial Ecology published a special issue: Exploring the Circular Economy. "Interest in the circular economy has grown remarkably in recent years. Viewed as a concept by some, a framework by others, the circular economy is an alternative to a traditional take-make-dispose linear economy. A circular economy aims to keep products, components, and materials at their highest utility and value at all times. The value is maintained or extracted though the extension of product lifetimes by reuse, refurbishment, and remanufacturing as well as the closing of resource cycles—through recycling and related strategies. As the concept of the circular economy has gained traction in business, governments and NGOs, there is a need to grapple with the inevitable complexity and trade-offs involved in an emerging framework. This special issue examines environmental, resource, engineering, managerial, design, and policy dimensions of the circular economy." In 2016, the Ellen MacArthur Foundation launched the New Plastics Economy initiative to "re-think and re-design the future of plastics, starting with packaging." The New Plastics Economy Innovation Prize will award $2,000,000 in funding for "better materials, clever product designs and new, circular business models." The UK Recycling Association said "improvements are desperately needed in product design," as they praised the innovation prize and criticized packaged products which are not easy to separate for recycling, such as Pringles chip cans and plastic beverage bottles that are enclosed in a different type of plastic sleeve. And in May 2017, the Foundation launched a new Circular Fibres Initiative "to build a circular economy for textiles starting with clothing." California Product Stewardship Council's (CPSC) Heidi Sanborn is quoted in two recent articles on the changing waste stream as more consumers shop from home and receive packages with ice packs in cardboard boxes from services such as Amazon and Blue Apron. Sanborn called on businesses to reduce their packaging while at the same time consumers need to ask businesses for less and more reusable packaging. Mother Jones estimated that Blue Apron sends out "192,000 tons of freezer-pack waste every year... the weight of nearly 100,000 cars or 2 million adult men." Sanborn said "the current arrangement suits the meal-kit providers just fine. It's taxpayers that are paying for these old freezer packs to sit in the landfill forever. Companies are getting a total freebie." The necessity of "Right to Repair" laws is explored in a March article in Wired by Kyle Wiens, the co-founder and CEO of iFixit, "an online repair community and parts retailer renowned for its open source repair manuals and product teardowns." "These days, performing all but the most basic repairs requires specialized tools and knowledge that companies like Apple and Samsung guard jealously... Not long ago, anyone with the time, tools, and patience could repair damn near anything... Then manufacturers started using copyright laws to keep their repair manuals offline, proprietary fasteners to seal their products, and in some cases, digital rights management to protect their software. The same short-sighted policies that make it difficult to repair your phone or tablet make it equally hard to recycle it. All the challenges facing independent repair shops effect independent recyclers, too. Right-to-repair legislation would make it easier to fix anything electronic. Laptops. Televisions. Drones. Smart refrigerators. Even tractors. Anything driven by a processor or controlled by software has become all but impossible to repair. Just ask a farmer. Ten years ago, any farmer with a lick of sense could repair a tractor or other equipment, or summon a mechanic to do it. Now they find themselves beholden to dealerships with proprietary software and diagnostic tools." According to Resource Recycling a May Supreme Court ruling means that "brands can’t use patent law to block the resale of their products". Wiens hailed the decision, saying "this cements your ability to resell or repurpose products without being beholden to the original patent holder." The Supreme Court ruling was on a dispute between "a company that makes printers (Lexmark) and a third-party company that makes and refills ink and toner cartridges for use in printers (Impression Products)." Consumerist, a subsidiary of Consumer Reports, reported that the ruling means "ultimately, that patent law recognizes that when you buy a thing, it’s yours, and the entity that made it doesn’t get to control it or you in perpetuity... Of course, patent law isn’t the only law in play. Companies use copyright law and DRM to control your purchases after you make them all the time, from digitally-distributed books, movies, and music to much more tangible goods, like your car. And, as the Supreme Court points out several times, contract law — terms and conditions you agree to — is still enforceable, apart from any patent exhaustion restrictions." In 2016, as part of efforts to create jobs and reduce carbon emissions, Sweden passed "tax breaks on repairs to everything from bicycles to washing machines so it will no longer make sense to throw out old or broken items and buy new ones." "Spain is the first European country to set a mandatory, national reuse target... at least two per cent of furniture, textiles and electrical items must be redirected from both landfill and recycling to be sent for repair and resale." A bill in the Oregon legislature, HB 3143, would allow appliance owners of "durable household goods" (a dishwasher, refrigerator, oven, washing machine or dryer) to deduct from their personal income taxes 50% of the cost to repair those household goods, delaying their end-of-life. In a Recycling Today article from September "electronics recyclers that wouldn’t have looked at reuse as an option in the past now are considering it as another revenue source."